How did the star and co-writer of hit comedy The Big Sick react to being denied a Golden Globe nomination? By pretending to be Steven Spielberg. 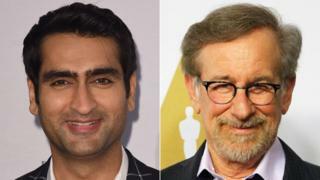 After the announcement of this year's nominations, Kumail Nanjiani tweeted what was purported to be an endorsement of his film by the celebrated director. Claiming he was "tweeting from Kumail's phone", 'Spielberg' called The Big Sick "my fave movie this yr". The suspect tweet continued by calling it a "great movie to watch w the fam". "I watched it w[ith] my family (the Spielbergs) & we all loved it," the tweet concluded. "Handing phone back to Kumail now." After the Deadline website questioned the veracity of the tweet in an online article, Nanjiani's account posted another 'message' from the multiple Oscar winning-director. "Hey @DEADLINE, Steven Spielberg tweeted that!" the message read. "I'll give the phone back to him." "This is Steven (Spielberg.) I tweeted that," the message continued. "I directed Jaws, ET, BFG. See? I can name 3 of my films. It has to be me." The comical confusion prompted other Hollywood figures to join the conversation, among them comedian Mike Birbiglia, who said he thought the tweet purporting to be from Spielberg appeared "fishy". The Last Jedi director Rian Johnson also got involved. Pretending Nanjiani had co-opted his phone, Johnson posted a message that claimed Spielberg was now in possession of Nanjiani's mobile. "If anyone has eyes on Steven Spielberg please tell him I'm not mad," wrote Johnson under the guise of Nanjiani. "I just want my phone back." "I'm praying Spielberg sends a cease and desist letter," chipped in Frozen star Josh Gad. "It's the only thing that would give this saga a proper thrilling ending." Eyebrows were raised on Monday when The Big Sick failed to receive a single nomination from the Hollywood Foreign Press Association, the body behind the Golden Globes. Written by Nanjiani with his wife Emily V Gordon, the film tells of two lovebirds whose mixed-race relationship is put under strain when one of them falls into a coma.